Prairie Agricultural Machinery Institute (PAMI) recently studied air movement through a 25,000-bushel bin. With canola, they found that a standard, single phase 10-hp centrifugal fan could not push air through canola when the bin was full. In fact, the threshold for that bin seemed to be about 17,000 bushels. The situation was worse with two 10-hp fans. Two fans provide more overall airflow but do not add additional force. As a result, two fans actually increased the static pressure and reduced conditioning capacity to around 10,000 bushels. Research is ongoing but the implication of the initial finding is that there is a limit to how big the grain bins can go with single-phase-power aeration fans. A 10-hp fan is the maximum size that growers can use on the farm with single-phase power. To use a bigger fan, the yard would have to upgrade to a three-phase electrical system or consider a PTO-powered fan. Without that, farmers may not want to fill big bins completely full when conditioning canola for safe storage. 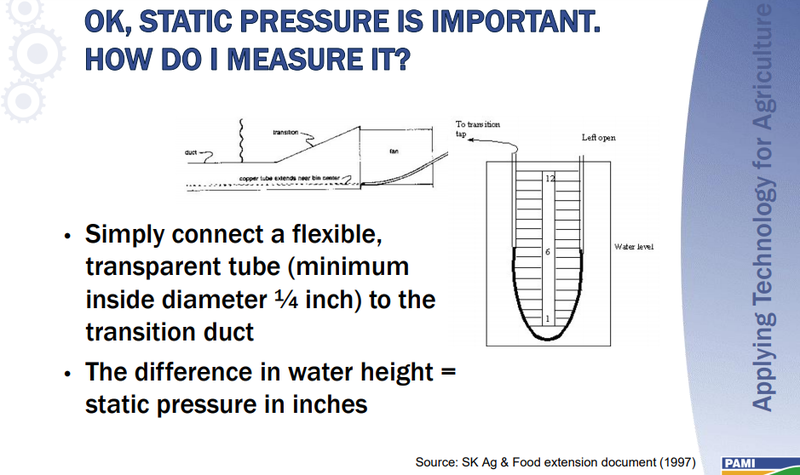 To test airflow and find the sweet spot for fan operation, use a static pressure gauge. Wilde Ag Ventures makes a gauge (featured in this article) that converts static pressure to airflow rate. Joy Agnew also provides the following directions to make a nanometer to measure static pressure. 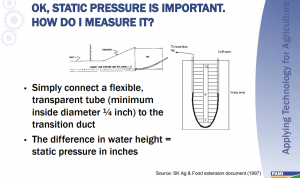 The static pressure data will correspond to an expected air flow rate for a given fan, which can be used to calculate the air flow per bushel. The calculated airflow per bushel is important depending on the intent of the fan operation.